RRVW is eager to help existing and new customers grow their business operations. We can provide suggestions for site locations which connect you with area utility companies who provide the services you need. We can also offer expertise on track construction and other services to help your business grow. In partnership with BNSF Logistics, RRVW developed 12 acres of land to create the Pingree Logistics Park (PLP). PLP has developed land adjacent to the RRVW track covering 1,400 linear feet. 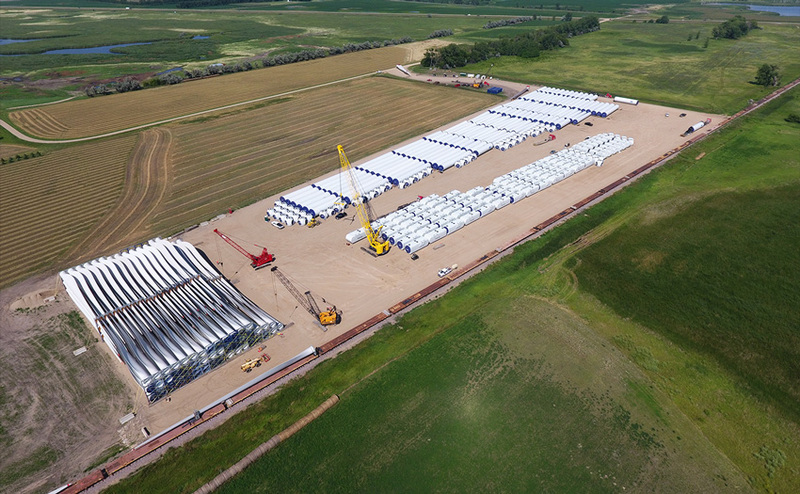 With easy access to Highway 281 and the BNSF yard in Jamestown, ND, PLP is the perfect location for any temporary or long-term transload opportunity. The RRVW yard is located in Breckenridge, MN. Here you will find a number of “shovel-ready” sites along our mainline and siding tracks where your new business could prosper. We also have several 10+ car self-serve transload tracks and a cross dock ready for your boxcar or flat car transloading. Davenport is located 20 miles from the heart of Fargo, ND. With paved highway and interstate systems connecting the two cities, Davenport is a great location to accommodate your transload needs or develop new business. Casselton is located 21 miles west of the Interstate 29 and Interstate 94 intersection. This makes Casselton an ideal location to place any new business or transload goods for shipment. There are several yard tracks here that can accommodate single cars and unit train shipments. The City of Casselton also has an 80-acre industrial park with all the necessary public utilities for new businesses. RRVW can ship your cargo from point A to point B and beyond using our network and our partnership with the BNSF Railway. We can help you ship almost anything. Why ship with RRVW? We are not just another railroad, but a quality service transportation provider you can depend on. We are committed to providing high-quality transportation service with a focus on safety. Contact us today to see how we can help you with your transportation needs. © 2018–2019 Red River Valley & Western Railroad Company. All rights reserved.